Beckworth LLC can really help make your home stand out with custom windows we can get designed and ordered locally. Decorative windows sometimes referred to as picture windows, are available in a variety of custom window shapes and sizes with endless design possibilities. With the large variety of custom window shapes available, you can create a unique window ideal for your home. 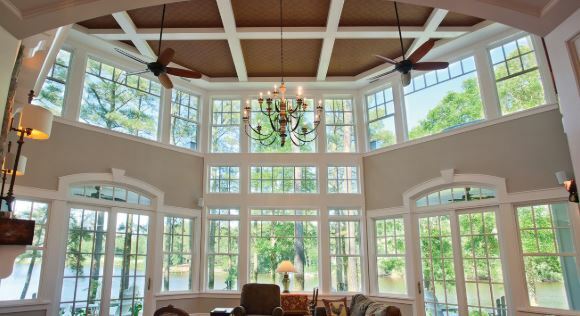 From circles and octagons to trapezoids and triangles, there are a ton of possibilities for your home when it comes to custom windows. You just decide the shape and materials and we will do the rest. There are a ton of color options to consider when deciding the direction you want to go with your interior and exterior window designs and this doesn’t even include the stains needed for the framing. The benefit of custom windows is that you have full control over what you want it to look like and the end result we will work on creating for you. Standard 7/8-inch glass packages help maximize your heating and cooling returns so when deciding on important parts outside of aesthetics, you should plan on double or triple pane glass. According to the federal government’s Department of Housing and Urban Development studies, up to 70 percent of energy loss occurs in windows and doors with 90 percent of window heat loss occurring through the glass. You may also want to consider privacy glass which are windows for your bathroom and other private areas of your home. Also known as etched glass, custom groove glass can enhance your home’s appearance by giving your windows an elegant and distinctive charm. Choose from eight unique etched patterns to reflect your personal taste and style. All eight etched glass patterns can be created using one of three etching styles. Choose from Polished, Frosted or Shadow. Depending on the interior and exterior finishes you choose for your windows, you’ll want to coordinate your window grids to match. We offer a variety of interior and exterior of choices for maximum personalization. If you’re considering custom windows for your home, call Beckworth for a free quote (703) 570-6777, or use our contact form. You can also find good resources on our Blog or Facebook page.